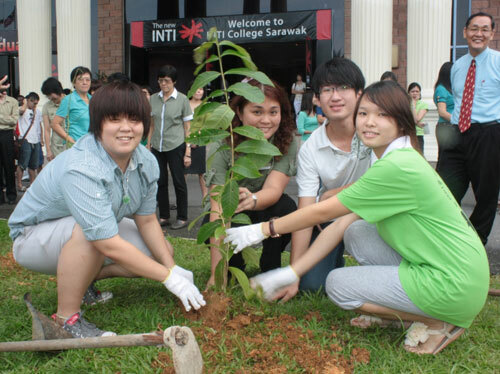 INTI College Sarawak’s commitment to green the environment took root with a tree-planting ceremony on campus, which also marked the start of a week-long series of eco-friendly activities involving its students and staff. 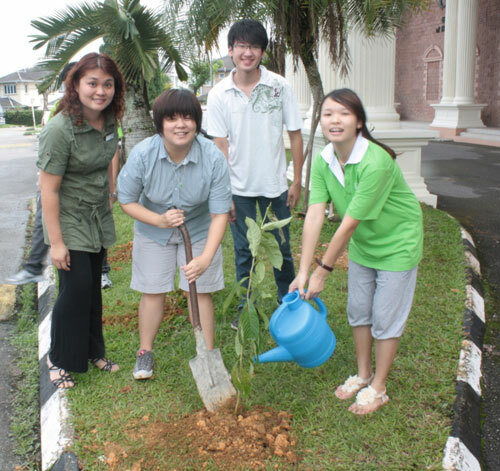 Held in conjunction with Earth Day, the tree-planting ceremony was an initiative of INTI’s Cambridge A Level Club. Leading the enthusiastic team of planters were the club’s president Kelly Kuek, INTIMA (INTI’s student government) president and vice-president of activities Brenda Teo and Bong Jin Kai, and the College’s chief executive and principal, Ivy Lau. Ivy Lau with Brenda Teo, Bong Jin Kai and Kelly Kuek. “Earth Day is observed in appreciation of the natural environment and to spread the message of environment conservation. As custodians of the Earth, we are all responsible for ensuring that future generations do not suffer from our actions or the lack of it. It all starts with the individual,” said Lau. Lau added that efforts to create a lush garden environment on campus run in concert with initiatives to enhance recycling and reduce the carbon footprint. Brenda Teo, Ivy Lau, Bong Jin Kai and Kelly Kuek. “Energy conservation is part of our culture. For example, we conduct meetings via video conferencing to reduce the amount of long-distance travelling and turn off lights and electrical appliances when they are no longer in need,” she said.